Its museums and libraries welcome all strangers to the Yard, to enclaves of art, books, bones, theater . . .
CAMBRIDGE - We Cantabrigians often treat Harvard Yard as a shortcut to Harvard Square, barely registering the solemn buildings and towering trees of the university's inner sanctum. The late David McCord, perhaps Harvard's most enthusiastic alumnus (Class of '21), would have been appalled. "Other American colleges have campuses, but Harvard has always had and always will have her Yard of grass and trees and youth and old familiar ghosts," he wrote in 1948. Even then McCord lamented the "swirl and jangle of traffic" in Harvard Square, preferring the tranquillity of academe. "Withdrawn from all the noise and sick hurry of the day," he noted, "the stranger may enter the Harvard Yard." The university is surprisingly open to "strangers," and not just Harvard Yard. Admission to Harvard museums, libraries, or collections is often free or relatively inexpensive. The free tours led by Harvard undergraduates are billed as historical walking tours, and your guide will certainly explain that the college was founded in 1636 and named for benefactor John Harvard, who bequeathed his li brary and half his estate when he died in 1638. Harvard's statue is the school's prime photo op. The campus stroll also provides a glimpse into the psyche of the university's young scholars. Despite fighting a cold, Shaan Hathiramani ('08) was surprisingly upbeat on a gray mid-February afternoon. "This marks the beginning of my senior spring, so I'm very happy," said the applied math major from Englewood Cliffs, N.J., who has already secured a job in finance. "This is the nexus of Harvard, the lifeblood," he said, pointing into the Old Yard, where red-brick Massachusetts Hall, built in 1720, is the oldest surviving campus building. "Most buildings are freshman dorms; it's pretty cool that freshmen are put at the center of things," said Hathiramani. "JFK was in Weld; Al Gore and Tommy Lee Jones were in Mower." Though he's not a big fan of the 1973 Modernist-style Science Center, just outside Harvard Yard, Hathiramani remembers his freshman physics class there well. "My professor had a long beard and looked like he was out of 'Lord of the Rings,' " he said. "I later realized he was one of the foremost figures in the field. That pretty much describes your experience at Harvard." The nearby polychrome brick Memorial Hall was built in the 1870s, in part to honor Harvard alumni who died fighting for the Union in the Civil War. (Confederate casualties were recognized later.) The renowned stained glass windows, Hathiramani said, depict the "prophets of knowledge and learning." The building's Sanders Theatre hosts concerts and other events open to visitors, but Annenberg Hall, the freshman dining hall, is off-limits. "You can imagine it if you've seen Harry Potter," said Hathiramani, evoking a scene of long wooden tables beneath chandeliers. Commencement takes place on the grassy strand between Memorial Church and Widener Library, built in honor of rare book aficionado Harry Elkins Widener (Class of 1907), who perished on the Titanic. The imposing building with its long staircase and fat columns has 50 miles of bookshelves, making it what Harvard calls "the world's largest academic library." Harvard's holdings in art, archeology, and natural history are no less impressive - and they're often more accessible. The array of university museums can seem daunting. Take a tip from the design of a core curriculum and start with the encyclopedic museums for an overview, then graduate to more specialized collections as your interests dictate and time allows. Speaking of time, there's not much left before the Fogg Art Museum and Busch-Reisinger Museum (which is entered through the Fogg) close June 30 for an expected five-year renovation. Starting over the summer, selections from all three of the university's art museums will be displayed at the Arthur M. Sackler Museum, across Broadway from the Fogg. To see more, go now. The Fogg's galleries circle an Italian Renaissance-style courtyard and display Western art from medieval times forward. The "Investigating the Renaissance" exhibition highlights the Fogg's role as a teaching museum. One case displays simple ground pigments and illustrates how artists prepared wooden panels for painting. Another display reveals how modern science - tree-ring dating of the support panel and infrared reflectography to see beneath the pigments - helped confirm the date and attribution of an early 16th-century painting of the Last Judgment that the Fogg acquired in 1997. The Fogg is filled with little gems, but the crowds gravitate to the Wertheim Collection of lovely, largely upbeat Impressionist and Post-Impressionist art. Both art and architecture get more hard-edged and angular as you pass into the 1991 addition that houses the Busch-Reisinger collection of central and northern European art, particularly German Expressionism. With its bold colors and lively composition, Franz Marc's "Red Horses" (1911) dominates the entry hall, a great introduction to the galleries. Try to visit on Wednesday to see László Moholy-Nagy's kinetic sculpture "Light-Space Modulator" in action. It's activated at 1:45 p.m. The Sackler Museum is starting to make room for artwork from its sister museums, but you can still peruse the Chinese bronzes and Buddhist sculpture, and late Indian sculpture on the fourth floor. Until March 23, the second floor holds an intriguing exhibit of Persian, Turkish, and Indian images of the story of the star-crossed lovers, Majnun and Layla. There is a tradition of sharing space at Harvard. The Harvard Museum of Natural History and Peabody Museum of Archaeology and Ethnology occupy a red-brick building sandwiched between Oxford Street and Divinity Avenue. "You can get from one to the other through the climate change exhibit," staff at the admissions desks tell confused visitors. One of the Peabody's strengths is its collection of Native American artifacts. Through June, the museum features what it calls the "only surviving Native American objects associated with the [Lewis and Clark] expedition," a fascinating snapshot of cultural contact between sovereign nations. Ongoing exhibitions in the Hall of the North American Indian provide a broader overview of how lifestyles of the continent's indigenous peoples have changed over the last thousand years. Up two flights you'll find hints of the museum's extensive work literally unearthing and interpreting ancient Mayan culture. Floating overhead from the mezzanine (technically the fourth floor) are Pacific island dugout vessels. It's a Cantabrigian cliche to take one's visiting grandmother to see the Glass Flowers at the Natural History Museum, but these intricate and scientifically precise botanical models represent the apex of the glassblower's art. The galleries have the hush of a library as visitors tiptoe around the cases and marvel at more than 3,000 fragile models created in 1886-1936 by Leopold and Rudolph Blaschka. On weekends children throng the other Natural History galleries, studying the meteorites or squealing at the skeleton of an Ice Age giant sloth. Parental attempts at explanation often meet with youthful exasperation. "I know what a baleen is. I studied whales in school," we overheard one young scholar informing her mother. Want more? Then you're ready for some of the more specialized collections, beginning with the Semitic Museum, across from the Peabody on Divinity Avenue. Devoted to archeology of the ancient Near East, the museum's exhibits capture both the sweep of civilizations long vanished beneath the sands and the piquancy of individual lives in those long-ago kingdoms mentioned, sometimes only in passing, in the Old Testament. A current exhibition re-creates life in the land of Judah circa 700 B.C. Harvard may have been founded as a divinity school, but it has a long history in the physical sciences. 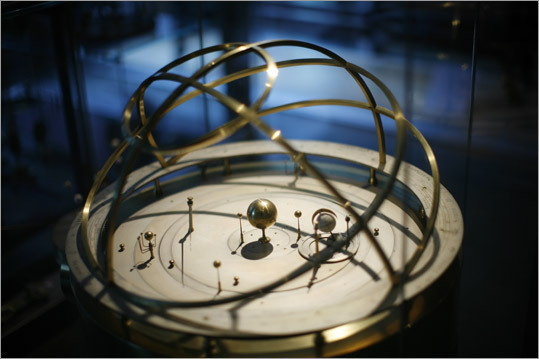 The Collection of Historical Scientific Instruments in the Science Center preserves some of the precision equipment used at Harvard to tease out secrets of the universe, ranging from a 16th-century Persian astrolabe to the control panel for the proton-beam cyclotron that was retired in 2002. Don't miss the 1765 celestial globe showing the constellations. You'll find another such globe, made by the legendary Flemish cartographer Gerard Mercator, at Pusey Library, back in Harvard's New Yard. The library holds both the Harvard Map Collection (where the current exhibit honors pioneering mapmaker Henry F. Walling), and the Harvard Theatre Collection, a trove of playbills, posters, scripts, and theater paraphernalia. The current exhibition chronicles productions of George Balanchine ballets. Check out the model of London's Globe Theatre to imagine playgoing in Shakespeare's day. Although held in Pusey, the Theatre Collection is part of Houghton Library, Harvard's repository of rare books. Stop in for the Friday afternoon tour, which we think of as an annotated visit. Through April 26, you'll begin with the exhibition of recent acquisitions, which range from illuminated medieval manuscripts to the first draft manuscript of Gore Vidal's "Myra Breckinridge." After visits with Emily Dickinson and John Keats, you'll conclude in the inner sanctum of the Hyde Suite, which holds works written by, owned by, or written about the seminal lexicographer Dr. Samuel Johnson. You don't have to end your Harvard forays when the sun goes down. The Harvard Film Archive screens foreign and classic films almost every evening except Wednesday year-round. If you prefer live action over celluloid, the American Repertory Theatre performs at Loeb Drama Center and the intimate Zero Arrow Theater. Cambridge-based freelance writers Patricia Harris (Class of '77) and David Lyon can be reached at harris.lyon@verizon.net. Depart from Holyoke Center 1350 Massachusetts Ave. 617-495-1573; harvard.edu Through May 2 Monday-Friday 10 a.m. and 2 p.m., Saturday 2 p.m., no tours March 22-April 1. June 24-Aug. 15 Monday-Saturday 10 and 11:15 a.m., 2 and 3:15 p.m. Free. 11 Divinity Ave. 617-496-1027 peabody.harvard.edu Daily 9 a.m.-5 p.m. Admission for both: Adults $9, seniors and college students $7, ages 3-18 $6. Free to Massachusetts residents every Sunday until noon. 485 Broadway 617-495-9400 artmuseums.harvard.edu Monday-Saturday 10 a.m.- 5 p.m., Sunday 1-5. Admission for all three: Adults $9, seniors $7, college students $6, 17 and under free. Free Saturday before noon and daily after 4:30 p.m.
6 Divinity Ave. 617-495-4631 fas.harvard.edu/~semitic Monday-Friday 10 a.m.-4 p.m., Sunday 1-4. Free. Harvard Yard 617-495-2440 hcl.harvard.edu/libraries Tour Friday 2 p.m. Free. Harvard Yard hcl.harvard.edu/libraries Photo ID needed for day pass. 617-495-2445 Monday-Friday 9 a.m.-5 p.m. Free. 617-495-2417 Monday-Friday 10 a.m.- 4:45 p.m. Free. Putnam Gallery Science Center 136 1 Oxford St. 617-495-2779 fas.harvard.edu/~hsdept/chsi.html Monday-Friday 11 a.m.-4 p.m. Free. Carpenter Center 22 Quincy St. 617-495-4700 hcl.harvard.edu/hfa/ Year-round film screenings. Adults $8, seniors and non-Harvard students $6. Loeb Drama Center, 64 Brattle St., and Zero Arrow Theater 617-547-8300; amrep.org Season runs through June 8. Tickets $39-$79, $10 discount available for seniors, $25 tickets available for students. Up to 50 same-day tickets sold for $15.